Neuropathy is a medical term used to describe a range of health problems in which peripheral nerves damaged causing tingling or numbness, usually in the hands and feet. Neuropathy is not a particular disease, but it is a complication caused by the combination of different underlying medical conditions. Doctors call it “idiopathic” when the primary cause is not yet diagnosed. The term neuropathy is actually short for peripheral neuropathy which means that there is nerve damage in parts of the peripheral nervous system. Take note that peripheral neuropathy doesn’t include nerve damage in parts of the central nervous system. It involves nerves outside of the brain and spinal cord. There are a number of peripheral neuropathies from different causes. The range is broad from carpal tunnel syndrome to nerve damage caused by diabetes. Peripheral neuropathies are more common in people older than 55. Neuropathies are classified according to the problems they cause or the root of the damage. 1. Mononeuropathy: This is when the damage is only to a single peripheral nerve. The most common cause is trauma or physical injury like in the case of an accident. Prolonged nerve pressure from long periods of being sedentary (like in the case of lying in bed) or continuous repetitive motions can cause mononeuropathy. The most common type is carpal tunnel syndrome. 2. Polyneuropathy: This accounts for the greatest percentage of peripheral neuropathy cases. It affects multiple peripheral nerves in the body which malfunction at the same time. There is a wide variety of possible causes including toxin exposure (like alcohol abuse), vitamin deficiency and complications from cancer or kidney failure. 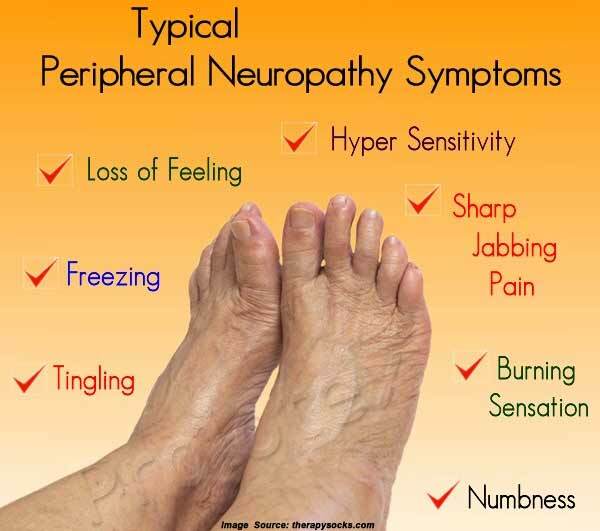 These are the common symptoms of peripheral neuropathy. A tingling or painful sensation. Increased sensitivity of certain parts of the body. Reduced reflexes especially in the ankles. Serious problems of the foot including infections, ulcers, deformities and bone/joint pain. The top causes of neuropathy include physical trauma, infection, repetitive injury, metabolic problems and exposure to toxins and drugs. Most causes of neuropathy are caused by the metabolic disorder diabetes when it is simply referred to as diabetic neuropathy. 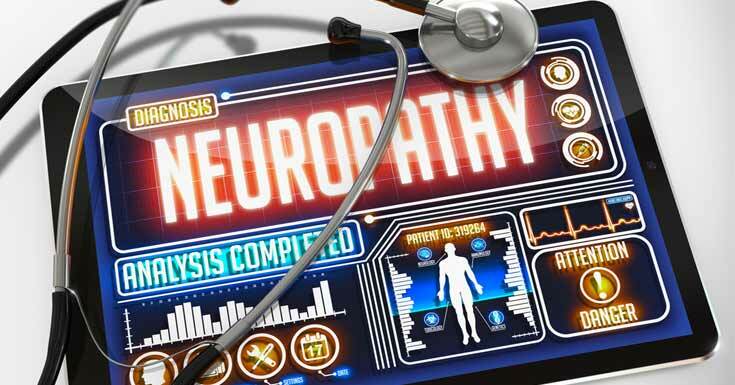 The other conditions that can cause neuropathy are chronic liver diseases, chronic kidney diseases, HIV and AIDS infection, long-term alcohol abuse, vitamin B deficiency and cancers. Infections like Lyme disease, hepatitis C, HIV and Epstein-Barr virus. Disorders of the liver, thyroid or kidney. Imaging Tests: CT or MRI scans to check for tumors or any other abnormalities. Nerve Function Tests: An electromyography may be ordered to determine if symptoms are caused by muscle or nerve damage. Nerve conduction studies may also be done. Other Nerve Function Tests: It may include an autonomic reflex screen, sweat test and sensory tests. Nerve Biopsy: A small portion of a nerve may be removed for examination. Skin Biopsy: This is for examining the number of nerve endings. The goal of treatment is to manage the condition that causes neuropathy that will also relieve the symptoms. If there is no underlying condition, the doctor will observe if the neuropathy improves. In the case of exposure to toxins or alcohol, such substances should be avoided. Medications: For relieving peripheral neuropathy, pain relievers, anti-seizure medications, capsaicin formulations and antidepressants may be prescribed by the physician. Therapies: There are various therapies and procedures that may be used depending on the type and extent of neuropathy. This includes transcutaneous electrical nerve stimulation, plasma exchange and intravenous immune globulin, physical therapy and surgery. Take good care of your feet especially if you have diabetes. Get regular exercise that helps improve muscle strength, relieve neuropathy symptoms and control blood sugar levels. Quit smoking since it negatively affects circulation. Follow a healthy diet making sure you get the important vitamins and minerals. Limit alcohol intake since it can worsen peripheral neuropathy. Monitor your blood glucose level closely. You need to be closely monitored by your healthcare provider to see if the neuropathy worsens or improves over time so treatment can be adjusted accordingly.